NOTE: Then...and Again Antiques announced July 6th that the auction is "cancelled indefinitely". Any boater who stopped at Vera's White Sands Beach Club and Marina before 2006 will remember the bar's exotic decor, and the glamorous Hollywood persona of its then-owner, Vera Freeman. 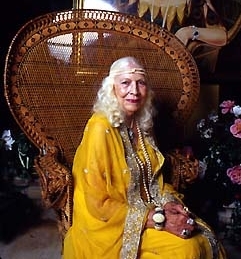 Vera passed away in 2007, just shy of her 93rd birthday, and now, her vast and eclectic collections are up for sale in July. The estate sale, held by Then...And Again Antiques from Annapolis, boasts more than 250 items. They range from vintage lingerie to ornate Asian art and antique nautical artifacts. She is said to have collected all of it over many years of worldwide travel. Vera, who went to Hollywood with dreams of becoming a starlet, ended up getting married and buying a large chunk of land overlooking St. Leonard and Johns Creeks in 1953. She and her husband built their grand home there, along with the building that would become Vera's White Sands. Vera was best-known for the grand entrance she made each evening at the bar. An authentic Chinese gong was rung, and she floated into the room usually wearing a long beaded gown, with a glittery headband adorning her platinum-blonde hair. For decades, the Freemans would operate the marina during the warm months, and then travel to faraway places in the off-season, bringing back countless souvenirs. Inevitably, those fascinating items landed in the bar. Freeman sold the marina and beach club to Steve Stanley and his wife, Lisa DelRicco, bar regulars, back in 2006 as her health declined. They kept certain special tributes to Vera, but the kitsch filling every nook and cranny is gone. Those folks who reminisce about "the old Vera's", will now be able take a piece of it home with them. A portrait of the young Vera is up for sale. Heck, her hat collection alone contains 80 different vintage hats, some completely covered in feathers. And yes, even the bronze Chinese gong is available. The sale is in Lusby, Calvert County, July 8th and 9th, beginning at 9 am both days. The specific address of the sale is to be revealed by Friday morning, July 7th. To look at some 200 photos of the items that will be for sale, click here.